It is without question that interacting with your targeted community and audience yields results, sometimes immeasurable ones. It is often an area overlooked, though acknowledged when we get around to actually discussing about community management and, down to the point, engagement. When I talk to game development companies and content-creators, the discussion about the community always revolves around how to earn a community and, ultimately, keep them dedicated to your brand. For many people and companies, their community interaction and consistency in that interaction has not only contributed to their fast-growing success, but also the reason their brand stands so strongly as a representative of the culture they’re servicing. People like Sean ‘Day 9’ Plott and companies like Twitch TV have secured a brand name ahead of their competitors because they took the right steps in becoming proud representations of the gaming sphere and being proactive in shaping their followings into marketable parts of their business/self. From starting your own community to building it and growing it, it takes a consistent amount of time, energy and dedication to keep them both satisfied and proactive in your product and you as a person. 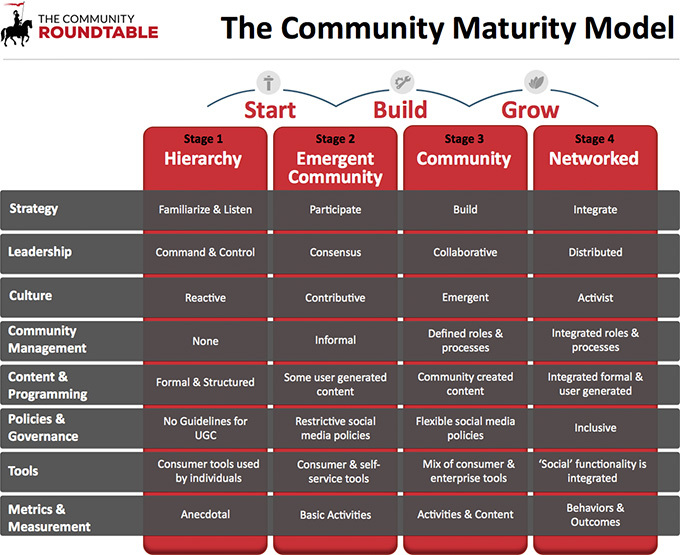 Courtesy of The Community Roundtable, this display helps frame the demand and stages into establishing a community and, on point, maintaining it. Whether it is eSports or general gaming, a genuine and consistent person of identity will always strive further than someone who takes advantage of their intended audience without giving something back. Getting away from your campsite of advertising such as your Facebook page or Twitter and using community websites to maximize your reach is great, but you must always give what you take and what you’re giving also improves what you want to reach: an audience. As with any conversation, you must talk as much as listen. In Philip Driver’s piece: The Beginner’s Guide to Community Management, he quotes a community as “a feeling that members have of belonging, a feeling that members matter to one another and to the group, and a shared faith that members’ needs will be met through their commitment to be together”. As you become a member, so will your influence and ability to share a faith that interconnects one another. Becoming involved and a part of a community, especially in the gaming culture, can be a delicate affair. Skepticism is a strong currency and the ability to dismiss you or your brand can be swift and sometimes permanent. The gaming community, even more so in eSports, can build entire careers or completely ruin them. In 2012, I had written about the Thin Corridors of New Content in which I highlight the difficulty of new content-creators jumping in as older, more established names struggle with maintaining their consistency and appearances. It was an immature outlook as we see the examples I highlight are some of the more prolific content-creators of this year (ChanmanV Productions for example), perhaps the techniques mentioned then are still relevant today. Nonetheless, it underlines the hurdle of community skepticism for new brands and emphasizes the advantages when incorporating trusted members into your team/product. ESports production companies and even services such as Twitch TV have used that advantage to bring awareness to their products as well as to acknowledge the community’s favoritism towards dedicated supporters of their favourite games/products (e.g. commentators). Conventions, LANs and Competitions are the monument of a productive community. This image of DreamHack shows what the largest LAN event can become in few years time, leading to now one of the largest and most successful eSports event circuits internationally. Communities are most than just a group of dedicated clientele, but a workshop base to draw useful feedback, tools and ability derived from their passion for your product or service. Is that not the foundation of Twitch TV’s service or Valve Software’s workshop platform? Maintaining that faith dismisses gamers’ initial skepticism and hence why the importance of consistency being mentioned so largely among some of the most popular entertainers in the industry: consistency in interaction and contribution beyond creating content you gain a direct advantage from. Reddit.com is similar but highlight the ratio typically expected: 9:1 ratio which is taken more exactly than intended as it means to be interpreted as you should be putting more in than what you want to take out. It’s important to realize that being self-involved with the community you want to reach out with your content/product is more than just creating things for that community to consume and reading their discussions. Without a constant presence of genuine interaction, interest and conversation, even as you hit massive success, the faith in your brand and reputation surely declines. For most companies, eSports is a mix of marketing and community engagement. For many games, without eSports, awareness of a product could not be as reaching and impactful to the gaming scenes without the involvement of an eSports community. Competitive sequels, brand strength and longevity of a game still hinges on the competitive aspect and, subsequently, the spectated tournaments. On that same vine, without eSports, careers of many iconic people from each game would not be where they are today. It is that mutual dependency and respect of expertise that have landed careers for many commentators and established strong relationships between companies such as ESL, Major League Gaming and even Riot Games and the communities they serve. Companies with a brand, know to remain consistent in the quality of their talent and consistency of fan-favourite talents. Your caster line-up is your face and proof that not only does your event know your audience but is constantly in touch with those who’ve established an earned trust with the audience and up-and-coming entertainers who you can promote and be unique compared to other events. ESL is known for their top-notch talent line-up and spares no expense to keep old favourites and introduce new faces. For a company, identity is important, iconic members that communities can relate and communicate with. In many ways, commentators serve that role while also liaising information that could change events and the content their consumers want to experience. Constant reception and an ability to consistently make their targeted audience productive in their feedback or more, is sign of good management from these production companies as well as an accomplished and constructive community. By hiring key members of the community for public roles, a company displays awareness of favourable people with their targeted audience using them to not only maintain a connection with the community, but also to bolster their brand and display a sign of dedication to the game the community attaches itself to. When Major League Gaming hired Nick ‘Axslav’ Ranish and Alex ‘Axeltoss’ Rodriguez, it cemented their intention to stick with StarCraft II despite opting away from creating events around the product. They secured an inherited community in case they were ever going to go back to producing massive events for the game. The same thing with ESL in which they keep a strong list of employed commentators to serve as experts for their respective genres as they attract game development companies to host their games’ events (e.g. Halo, Battlefield, Titanfall) and as talent to commentate those games. The key ability to create and maintain strong identities for the communities to relate to is a process that can be massively successful or a misfire. This is especially underlined for service companies such as ESL, MLG or even Twitch TV. 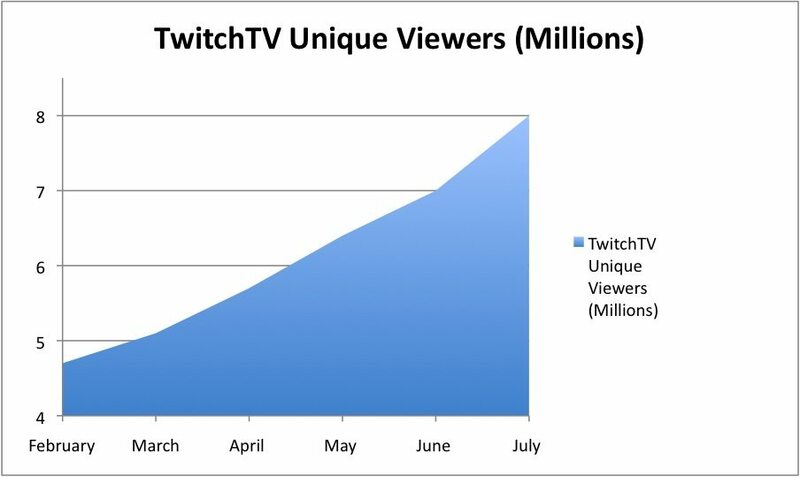 The concept of identity is no different for Twitch TV and in fact played a vital role in their incredible growth after only three years. I would go on to say that other livestreaming companies have failed to see how Twitch TV progressed with their identity while trying to imitate what they are doing now. For Twitch TV, growing from eSports and expanding to the gaming market is a strategy of playing to the advantages of smaller subcultures to establish reputation to eventually step into the mainstream culture of gaming. Before any other livestreaming site had started. Twitch TV established themselves as a contributor to teams and events (giving what you’re taking) and hiring key members of the games they want to penetrate. To give more detail: from 2010 to 2013, Twitch TV has sponsored more than 100 events/teams from every spectrum: ESL, Team Dignitas, Team Liquid, Absolute Legends, Empire, FXOpen, Karont3 Club, Fnatic, Natus Vincere, Grubby, Capcom Pro Tour, Godsgarden, DreamHack events, GeForce StarCraft II Pro/Am, TwitchTV White-Ra Meet Up. Not to mention their after-parties that still happen at most events as well as their charity work, etc. It doesn’t matter if each sponsorship was simply a typical partnership (ad-based revenue). It leveraged the relationship these organizations and events had with the community and at the same time, the organizations and events used Twitch TV to maintain or establish their legitimacy and intent to provide further content for their fans. By 2011, they already had 8 million unique viewers and had started to do coverage at E3 and Gamescom (2011). But it doesn’t stop there and it is just overall smart to be as aggressively involved as possible, even despite complaints from certain regions about lag and stuttering from Twitch TV which was a rampant mention for at least a year. Twitch TV was also smart in hiring key members of the eSports scene such as James ‘2GD’ Harding and Marcus ‘djWheat’ Graham in 2011. Even in djWheat’s announcement video, he makes it clear how supportive, involved and strong Twitch TV is with eSports. That still remains true to this day, though their presence has become even more direct with their own setups at events such as E3 and more recently, Comic-Con New York. Other notable names being hired at Twitch TV is Justin ‘TheGunRun’ Ignacio and Mike Ross from the Fighting Games Community among many other involved community members. This is not an unusual strategy and in fact, you can draw parallels with OnGamers.com in hiring key contributors to the scene to increase their brand’s visibility and create key relationship markers for communities to identify with. Team Razer is no different in their long history of supporting players and brands, going so far as to use them in their products and marketing. For companies following in their footsteps, their outreach to the community needs to be improved. For example, Azubu TV’s currently approach is very oriented towards the concept of Staying at Your Campsite as referenced in the sub-topic: Get Started, Keep Rolling. Where they contract many popular entertainers and competitors to livestream on their site to draw viewership but are typically uninvolved in the scene. To this day, their contributions revolve around creating content, whether written or video but very much hands-off in terms of direct affiliation and support of organizations, events and the community. When following in the footsteps of an already established business, a company’s proactiveness and need for identity should be emphasized even more strongly. This is especially in view of competitors such as HitBox.tv who have started creating their tournaments, albeit small, but a step in the right direction. In many ways, Valve Software has achieved the highest result in creating a proactive and established community. They have created a hands-off system of curating community contributions directly with their game. They are so much into being a helping hand for user-generated content (UGC) that their coming Source 2 engine revolves around making it easier for users to create content (ranging from maps to game modes and beyond). In Valve’s Steam Dev. Days Video, Valve highlights the perks of allowing user-generated content: exposing and renewing ways to play your game, giving customers a direct line of voice and provides ongoing value to customers. As we said in “Giving What You’re Taking”, Valve rewards those contributors through both (split) monetization as well as direct credit to the contributor. While it is arguable that Steam’s customer service is weak overall, their ability to engage users, interact with them beyond words and translate community into product-supporting contributors (whether it be through their ticket-compendium system, guides, mods and skins/items) is trend-setting. It furthers their ability to create identity as an open-platform in which the community serves themselves and gains from everyone’s support and popularity. On the other hand, Riot Games alternative approach is contrarily hands-on in amplifying their game’s pool of interest. Ranging from music videos, documentaries, their international championship series and coverage surrounding it to the varied media content including animated sequences and philosophy involving their gamers. Riot Games takes their product and furthers its range of unique content, interaction and reach through a variety of marketable forms and continues to pump out polished digestible mediums for fans to continue enjoying and feeling refreshed about their game that can be typically frustrating or challenging. You can love League of Legends without needing to play and that constant media stream keeps their word-of-mouth strong and their identity cemented. They shape their players, past and present, to be Summoners without being directly involved in the client. Whether being hands-on or hands-off, a constant stream of content to enhance your product directly in the client or surrounding is a priority. Communication about your updates in unique and appealing ways is priority number two. Team Fortress 2 has a history of creating fun ways to introduce players to new modes and get them excited for new updates. Whether it is through video or poster boards, Team Fortress 2 has had a constant stream of new content and maintains a strong and interesting way in communicating with their player base. In short, whether you’re a company or a person trying to create a following; forming an identity for yourself and remaining consistent with that identity, content and methods of interaction is much easier said than done. For those who have achieved it, especially in gaming, have made it tough to follow but not impossible. To create a community around what you have is nothing short of a question of persistence, confidence in yourself and the passion for what you’re doing, regardless if no one watches, reads or plays it. More simply put, becoming a person of value before seeing yourself as a person of success can lead to more apt objectives to aim for and make each progressive step all the more enriching for your self-being. I would add that the community feeds off what you give/say and reciprocates with a shared interest on anything further that you do. As a company, making your service or product is only half the battle. Learning how to talk to your customers is something else. In this day and age, marketing and communication is no longer one directional but rather circular and mutually benefiting, so long as you, the company, frame it that way. Being fair, genuine and authentic can go a long way to establishing long-term consumers rather than one-time unhappy visitors. To add, reaching out to your consumers in unique ways will create unique responses and unique justifications for them to visit your product/service.